Set Forth in Faith and Plant the Seeds of Faith! “Be the change you want to see in the world!” The Catholic Educational Association of the Philippines (CEAP) chose this line from Mahatma Gandhi as the theme for the 1st National BIDAHAN Youth Conference to encourage young Filipinos to bring hope to our country echoing the words of Dr. Jose P. Rizal: “Ang kabataan ang Pag-asa ng Bayan” (The youth is the hope of the Country). 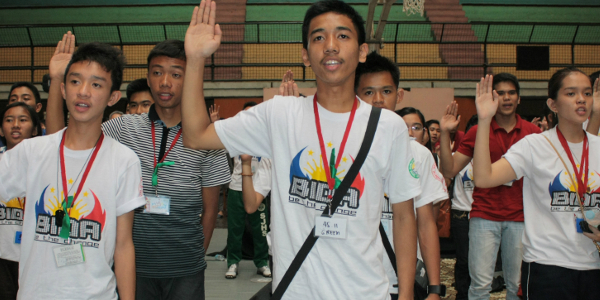 The BIDAHAN Youth Conference was held last September 27-28, 2013 at the University of San Carlos – Downtown Campus, Cebu City. More than 1,000 student leaders from all over the Philippines, including 41 students sponsored by the Communication Foundation for Asia, gathered to take part to learn from various activities and presentations. The first day was filled with fun and enjoyment with songs and dances of praises, interesting talks, eye-opening situations, heart-touching social current events presentations all calling participants to become FINE Fellows (Filipino Innovators, Nation Builders and Earth Advocates) who will lead their own schools into development. Resource speakers included Mr. Edwin Salonga for Innovation, Sen. Bam Aquino for Nation-building, and Ms. Melissa Yeung for Earth Advocacy. Based on the FINE Fellow model, a Catholic Youth who is an innovator, nation-builder and environment advocate will be able to build a nation which will stand firm on their faith. Pope Francis calls the youth to set forth in Faith, to be firm on their morals and be inspired by their kababayan saint, St. Pedro Calungsod, who, too, was a youth steadfast in protecting and faithfully living his Catholic Faith. As FINE Fellow “initiators”, the youth can inspire their peers to make innovations that will awaken their sleeping eager-spirits. Because they are tech-savvy, they can use social media and other tools to connect with people to share their fresh ideas while remaining firm in their stand in promoting justice and harmony and build a nation sensitive to the social, political, and moral issues of the country. The youth can also easily respond to the call of protecting Mother Earth, advocating even a simple act to protect nature that will have lasting effect for future generations. On the second day of the conference, Fr. Javy Alpasa, SJ facilitated an activity called “The Amazing gRace” which was based on the international game, Amazing Race. The participants were grouped into clusters for a special task assigned to them. Each cluster was divided into two groups to facilitate movement and security. Each group will take half-day turns, morning and afternoon, for two activities. One group first takes part in the race around USC called the ‘virtual tour’, and activities such as egg-hunting around the gymnasium to form series of words (eggs has letters on it), puzzles and challenges were all done within the campus. At the same time, the other group had a walking tour around various religious sites that greatly influenced the Catholic Filipino Faith such as the Basilica Minore del Sto. Niño, Magellan’s Cross, the Parian Shrine (where the history of Cebu was shown from the arrival of Magellan to present), and the old Jesuit Villa just near the Parian. Activities and challenges were given to delegates such as arranging jumbled letters, memorizing a Hispanic prayer to Pedro Calungsod, and dancing the traditional prayer dance at the site of Magellan’s Cross, etc. After the groups finished one activity, they will exchanged tasks. The Conference concluded with all the participants joining the procession of the images of the Virgin Mary, the Holy Cross and St. Pedro Calungsod from USC going to the Pilgrim Center (in front of the Basilica Minore del Sto. Niño) and a Eucharistic Celebration graced by his Excellency, Most Rev. Jose Palma, Archbishop of Cebu and President of the Catholic Bishops’ Conference of the Philippines.